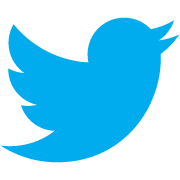 Miniboxing the Linked List (tech report) - describes the miniboxing transformation for Scala collections. To evaluate the miniboxing plugin, we implemented a mock-up of the Scala collections linked list and benchmarked the performance. 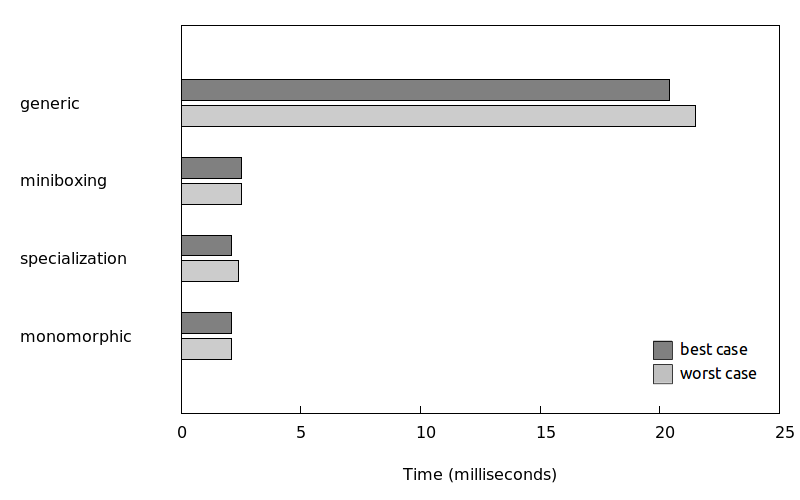 The result: 1.5x-4x speedup just by adding the @miniboxed annotation. And it’s worth pointing out our mock-up included all the common patterns found in the library: Builder, Numeric, Traversable, Seq, closures, tuples etc. 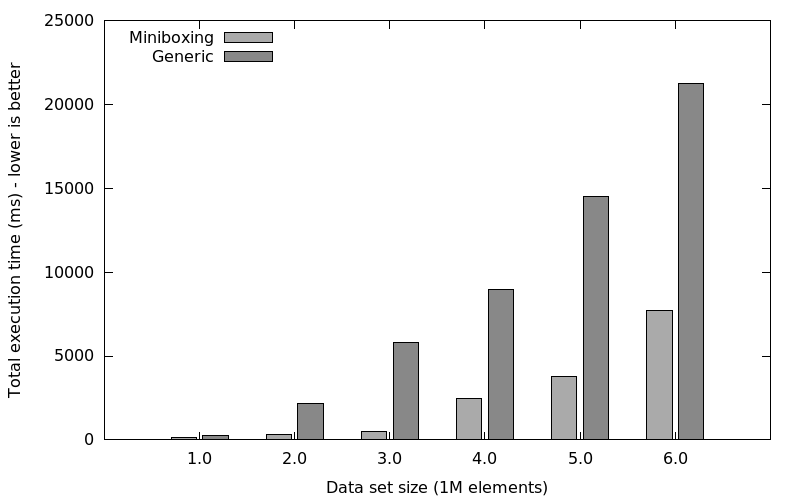 This shows miniboxed linked lists are 1.5x to 2x faster than generic collections, despite the fact that linked lists are not contiguous, thus reducing the benefits of miniboxing. We have also tested specialization, but it ran out of memory and we were unable to get any garbage collection-free runs above 1500000 elements (we suspect this is due to bug SI-3585 Specialized class should not have duplicate fields, but haven’t examined in depth). To summarize, on linked lists, we can expect speedups between 1.5x and 4x, despite the non-contiguous nature of the linked list. The full description of this experiment is available here. 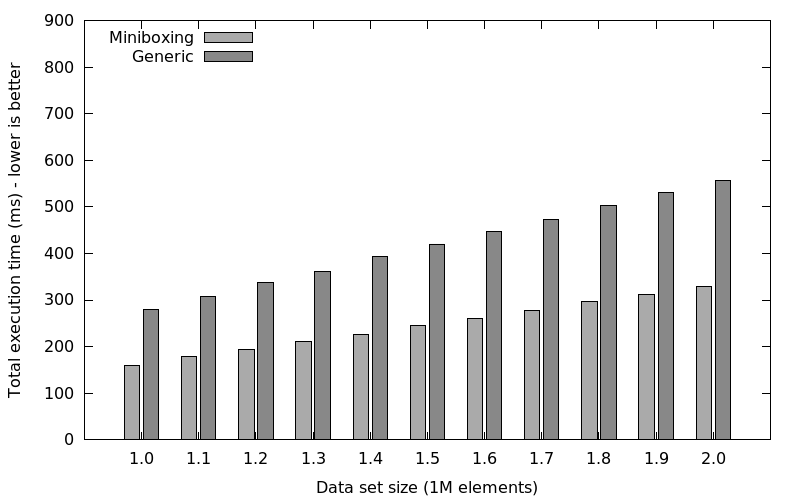 A separate article describes the performance of the spire numeric abstraction library when using miniboxing. Another important benchmark is the ArrayBuffer.reverse. This is the most difficult benchmark to get right, since the miniboxing transformation interacts with the Java Virtual Machine optimization heuristics and, if the transformation is not done correctly, miniboxing can actually hurt performance (more details in the OOPSLA paper). 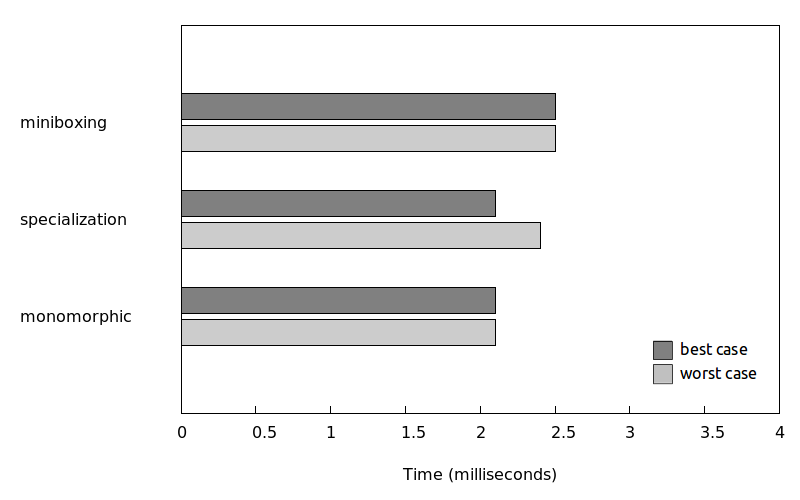 These benchmarks are further described in a Miniboxing OOPSLA’13 paper.